An iconic Australian tree Grevillea robusta is commonly called the ‘Silky Oak’, and with a wonderful display of golden yellow flowers from late spring to summer it is easily recognized. Attractive ferny foliage and the tree is a magnet for birds and flowers and regarded as one of the most attractive Australian flowering trees. With a fast rate of growth Grevillea robusta is now grown for timber in a number of countries where it is valued for furniture production. As a garden tree it does require a little space and is more suited to parks, rural areas and larger gardens. In its natural environment it will reach around 30m in height in ideal conditions, but usually around 10 – 15m in cultivation. They do tend to drop seed pods and a little leaf litter, however they are a fast growing tree and provide excellent shade. In some areas the Silky Oak has become an environmental weed, it spreads easily by seed and is best not planted near forested areas. Originally from New south Wales and Queensland Grevillea robusta or ‘Silky Oak’, is now grown widely across Australia and grows well as far south as Melbourne and Tasmania. One established Grevillea robusta is a hardy drought tolerant tree that requires little care. A well drained soil is essential as it doe not cope well with being water logged. The root system is vigorous and this is a tree that is best planted 15 – 20 metres away from drainage lines and sewerage systems. Plants are easily propagated from seeds, seedling trees will need to be protected from grazing animals using trees guards. 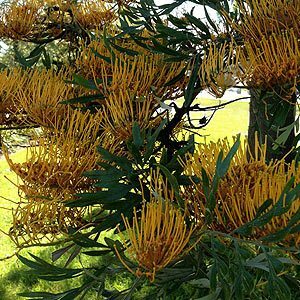 Botanical Name – Grevillea robusta. Common Name – Silky Oak. Spread – Crown will spread to 14 m on a mature tree in an open position. Root system – Vigorous and shallow. Growth Rate – Regarded as fast. Attracts nectar seeking birds as well as possums.